Most people will need or want to change their email providers and accounts at some time. Move to their own email hosting. Do you need to retain access to the old email messages? Do you need to retain access to the old contacts? What will happens to email sent to old address when you’ve moved? Do You Need Access to Your Old Emails? Before we discuss these in more detail you first need to understand where your email is currently being stored. Fortunately there are only three possible locations. The email server of your provider and your PC/Laptop. Whether you email is on the email server, on the client or both depends on how you have been accessing your email. If you you have been accessing your email using a web based client i.e. your browser then your email is stored on the email server only. If you have been accessing your email using a desktop based email client using IMAP then you email is stored on the email server and also probably on your PC/Laptop. If you have been accessing your email using a desktop based email client using POP3 then you email is stored on your PC/Laptop and possibly on the email server (received email only). This technique is common on large email migrations were it can take days/weeks to physically move all the email over. You configure an email client to access both the old and new email accounts. You can keep this arrangement for as long as you have access to the old email account. This means that you shouldn’t cancel the old account immediately. If you use a desktop client like Windows live mail then you have access to both accounts when you open up your client. Although this technique is generally only used as a temporary measure when doing corporate migrations for personal email you can use it indefinitely. Let’s say you were moving from Yahoo mail to Gmail then you could change your primary email address to the new Gmail address, but still continue accessing the old Yahoo email account. If you wanted to read old email that was sent to that account then you just connect to the Yahoo account. If you are doing this long term then using a desktop based client to access Gmail and Yahoo mail is the better option. Moving email messages between providers can be a long process if you are dealing with large mailboxes. Therefore consider carefully if you need to do it. Google, Yahoo and Microsoft (outlook.com) provide migration tools which will usually migrate the emails, and in some cases the contacts. Some will only import POP3 mailboxes which means that only your inbox will be imported. whereas others like outlook.com use IMAP4 migration which will import all of your folders. If you don’t have a migration tool then the easiest method of moving email is using an email client. The idea is simple. You connect the email client to the old and new mailboxes and copy the messages between the folders. 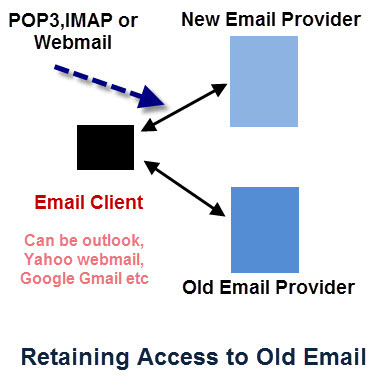 The tutorial Change from POP3 To IMap4. shows you this technique which also works if the source and destination mailboxes are on different providers, and if both mailboxes are IMAP4. Email clients and email providers like Gmail provide tools to export and import your contacts. For guidance take a look at exporting and importing contacts in Yahoo Mail and understanding and editing csv files. Generally most people will loose access to the old account after a while, and so it is important that you take steps to ensure it is no longer needed before then. Send a message to all of your contacts to notify the of the new email address. Monitor your old inbox to ensure that you aren’t getting important emails delivered there. It may take several months of monitoring to be sure. We will consider a single Scenario, but with various requirements. Scenario 1- Currently using Yahoo account with yahoo email address,, and want to move to Gmail with a new Gmail address . Want to retain access to old email messages and contactsl. Create a new account on Google. Because POP3 is being used with the same email client then there is no need to move any mail messages or contacts as they are already stored locally on the client. Forward new emails from the old address to the new address using automatic email forwarding. Notify old contacts of the new address. Want to retain access to old email messages and contacts. Contacts shouldn’t need moving as they are stored on the client. Notes: Because IMAP is being used the Email Is stored on the email server (Yahoo) and so needs either to be moved or you need to retain access to the old email account. Move the Contacts to the new account by exporting as a csv and importing into Gmail or use the Google migration tool. Notes: Because Webmail is being used the old Email Is stored on the email server (Yahoo) and so needs either to be moved or you need to retain access to the old email account. See Exporting Yahoo Email Messages. Q- Should you cancel your old email Address when the move is complete? A- Not unless you have to e.g. it is a paid account. It is a good idea to leave it about 6 months to make sure it is inactive. Q- Can I keep my old email address when I move from Yahoo to Gmail etc in the same way as when I move mobile providers? A- No, but you don’t have to give up the old address if you don’t want to, and can still use it as a secondary address. Q- What happens to my old email address. Will it be recycled? A- Some providers will recycle old email addresses after a certain period after cancellation. Q- How long after the move can I retain access to my old mailbox. A- As long as you want provided you continue to login to the old account on a periodic basis. Q- I’m moving broadband provider do I need to change my email address? A- It depends on whether or not your email is being provided by your current broadband provider. If it is you will need to change it.